(Formerly model 1474 x 24) 24" (610mm) surface-mounted towel shelf with towel bar type-304 stainless steel with bright polished finish. 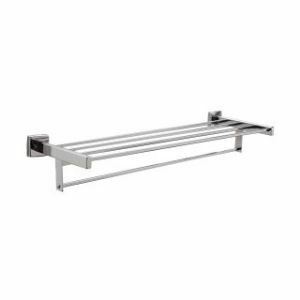 (Formerly model 1474 x 24) 24" (610mm) surface-mounted towel shelf with towel bar type-304 stainless steel with bright polished finish. Flanges and support arms 22 gauge (0.8mm) and equipped with concealed, 18‑gauge (1.2mm) mounting brackets that are secured to concealed, 19-gauge (1.0mm) wall plates with setscrews. Shelf 3/8" (9.5mm) diameter tubing. Towel bar 1/4&apos;&apos; (6mm) diameter tubing.